An organization may need to generate custom reports for many purposes varying from internal research to special reports for customers. Docsvault allows users to develop custom reports like pending invoices, region wise projects, new contracts by customer, agreements expiring this year and so on. These reports are created in real time based on many different criteria including document profile indexes and allow organizations to gain intelligence from reports in no time. Creating custom reports is quite easy using a simple wizard interface and is available to all users of Docsvault. Every user can create his or her own report as per their needs and make it publicly available or keep them private. 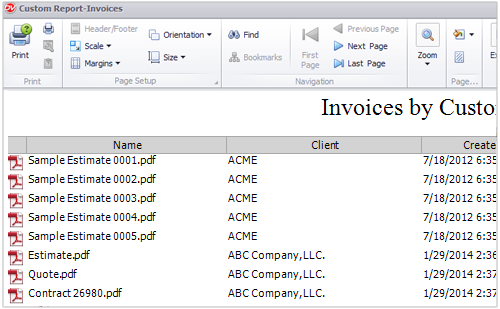 Reports can be run with a single click and can be printed out or exported out in various file formats like PDF, xls, xlsx, etc. Reports are generated based on index values, created or modified dates, location, size, document status, author, document notes, etc. You can save and email reports in various formats like PDF, Excel, CSV, etc. Say you need all invoices and their statuses for a particular customer for the last month or year or any other time frame. Traditionally, you would inspect all the invoices for that customer one by one and gather data. Docsvault Custom reports could do this for you in minutes. Once designed reports can be run in real time on demand without any further configurations. The best part it is done in three simple steps, so everyone can create the most accurate and up-to-date reports within no time.